Kohler-Rollefsonand Rollefson 1990;Rollefson and Kohler-Rollefson 1989, 1992) clearly prefer a model where local environmental degradation and settlement abandonment were culturally induced. However, the role of climatic change must be seriously considered. Certainly, climatic variations have long been invoked by archaeologists as being linked to cultural change in the Near Eastern Neolithic. Most models, however, focused on climatic variation as a device for stimulating agricultural origins (e.g.,McCorriston and Hole 1991;Moore and Hillman 1992)and have not explored how this might have impacted later Neolithic developments. We have examined this issue elsewhere, suggesting that these cultural developments occurred against a backdrop of steadily deteriorating climatic conditions (cf. Davis et al. 1990; Simmons 1995a). Based on regional archaeological, climatic, and geological data, we believe that the combination of drought in the Levant, ironically coupled with increased precipitation brought on by summer monsoons (cf. Kutzbach and Guetter 1986;Kuttbach et al. 1993;Streetand Grove 1979),the impacts of expanded human population, intensive agriculture and herding, and deforestation for fuel caused an environmental crisis that has dominated human adaptation in the region eversince (Davis etal. 1790; Simmons 1995a). Specifically, by ca. 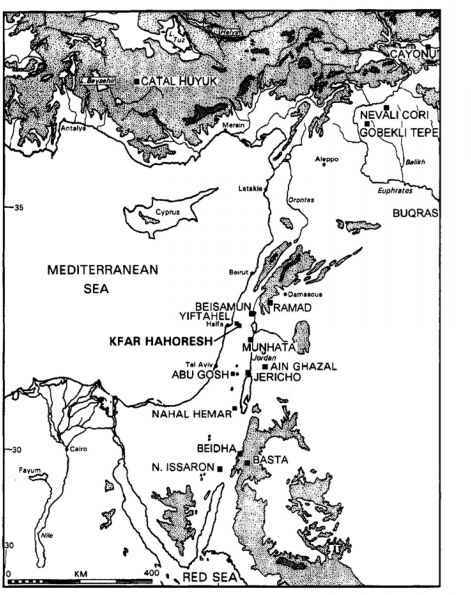 9,000 bp, a Mediterranean climatic regime apparently was well established in the Levant (Roberts and Wright 1993:201). At roughly the same time, however, summer precipitation may have declined and ceased altogether by about 7,000 years ago. Importantly, this occurs simultaneously with increased human-induced environmental degradation brought about by intense farming and herding and the eventual abandonment of major PPN/PN centers. It is important to realize, however, that increased precipitation, as proposed here, does not necessary translate into increased effective moisture. It is thus possible to have short-term and intense seasonal precipitation in conjunction with overall increasing aridity. We have suggested that loss of agricultural productivity may have begun with erosion accelerated by torrential summer rains (Davis et al. 1990). Previously forested areas cleared for fields, pastures, fuel, and settlements during the PPNB would have been especially prone to erosion by the PPNC/ PN. Possible evidence for the erosion occurs at many of the Jordanian sites as layers of comparatively well sorted cobbles. These may be attributed to debris flow caused by torrential summer thunderstorms, the physical manifestation of the increased monsoonal pattern. Erosion could have been increased if surrounding vegetation had been reduced by human activity and increasing aridity. This constellation of cultural and climatic activitieshad substantial ecological consequences, ultimately straining the landscape. This was particularly acute at sites such as PPN/PN settlements situated in ecologically frag ile zones. While the pattern of population aggregation and pooling of scarce resources were initially adaptive, they ultimately began to deplete the envi— ronment. This resulted in critical resource shortages that may have required an economic split between farmers and pastoralists, and resulted in the abandonment of the large PPN/PN communities and led to the establishment of the famed Near Eastern dichotomy between the "desert" and the "sown," or between village farmers and pastoral nomads (Kohler—Rollefson 1988, 1992; Kohler—Rollefson and Rollefson 1990; Rollefson and Kohler— Rollefson 1989; Simmons et al.1988).